Acute Otitis Media (AOM) presents over a course of days to weeks, typically in young children, characterised by severe pain and visible inflammation of the tympanic membrane. The patient may also have systemic features, such as fever and malaise. Although AOM is a common condition in young children, it can affect all age groups, including neonates. Importantly, however, in school age children recurrent episodes can lead to time out of education and the potential to develop chronic issues, such as hearing loss and developmental delay. More than two thirds of children will have had at least a single episode of acute otitis media by age 3. Bacterial infection of the middle ear results from nasopharyngeal organisms migrating via the Eustachian tube. The anatomy of the Eustachian tube in younger children is more horizontal, only becoming more oblique as the child grows. Hence, it is less prone to close during episodes of increased pressure, such as coughing and sneezing, meaning bacteria are more likely to be forced into the middle ear during a concurrent upper respiratory tract infection. Common causative organisms include Haemophilus influenzae, Streptococcus pneumoniae, Moraxella catarrhalis, and Streptococcus pyogenes, all common upper respiratory tract microbiota. Common viral pathogens are respiratory syncytial virus (RSV) and rhinovirus. Common symptoms of AOM include pain, malaise, fever, and coryzal symptoms, lasting for a few days. Pain can be difficult to interpret in young children, but they may tug at or cradle the ear that hurts, appear irritable, disinterested in food or have vomiting. 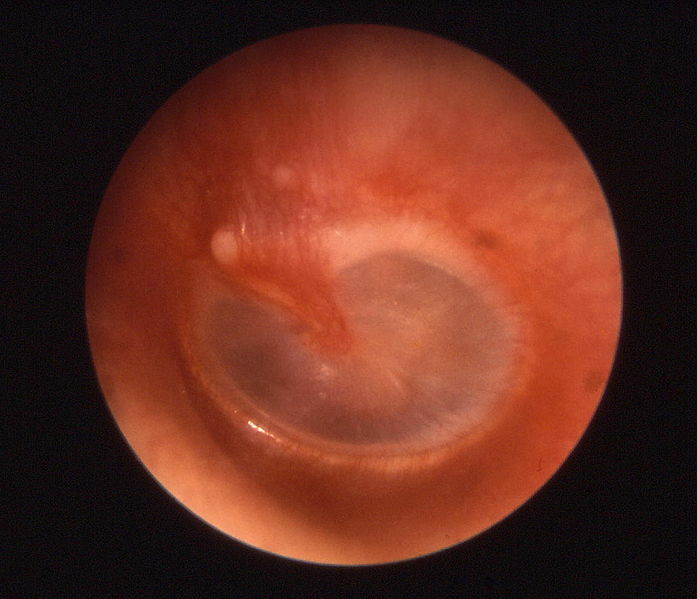 On examination, the tympanic membrane (TM) will look erythematous and may be bulging. If this fluid pressure has perforated the TM* there may be a small tear visible with yellow or purulent discharge in the auditory canal. Patients may have a conductive hearing loss, there may be cervical lymphadenopathy. 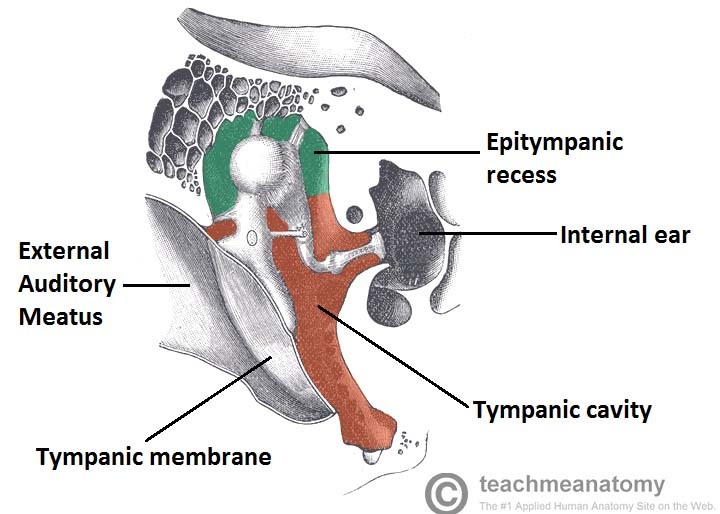 *Any extreme pain that suddenly resolves, followed by ear discharge is suggestive of a ruptured tympanic membrane. It is important to test and document the function of the facial nerve. Due to its anatomical course through the middle ear it is vulnerable. Examination should also include checking for any intracranial complications, cervical lymphadenopathy and signs of infection in the throat and oral cavity. Chronic Suppurative Otitis Media (CSOM), Otitis Media with Effusion (OME), Otitis Externa (OE). Less common differentials include meningitis, mastoiditis, intra-cranial extension of infection, intra-cranial abscess, or head and neck malignancies (in adults, especially with a smoking or alcohol history). Most cases can be diagnosed clinically, however bloods (FBC, CRP) will help confirm the inflammatory picture and are useful to gauge response to treatment. Any discharge should be sent for culture and blood cultures should be considered if pyrexial. The majority of cases of acute otitis media will resolve spontaneously within 24 hours, nearly all within 3 days. All patients should be treated with simple analgesics in the first instance. There is no need to treat with antibiotics in most cases and a ‘watch and wait’ approach can be taken provided there are no worrying features (as discussed below). Most commonly amoxicillin is the antibiotic of choice, however local guidelines should always be followed. Admission should be considered for all children under 3 months of age with a temperature >38, or aged 3-6 months with a temperature >39, for further assessment. Also, consider admission for those with evidence of an AOM complication or the systemically unwell child. Patients with a cochlear implant will need to be seen by a specialist and may require inpatient treatment. 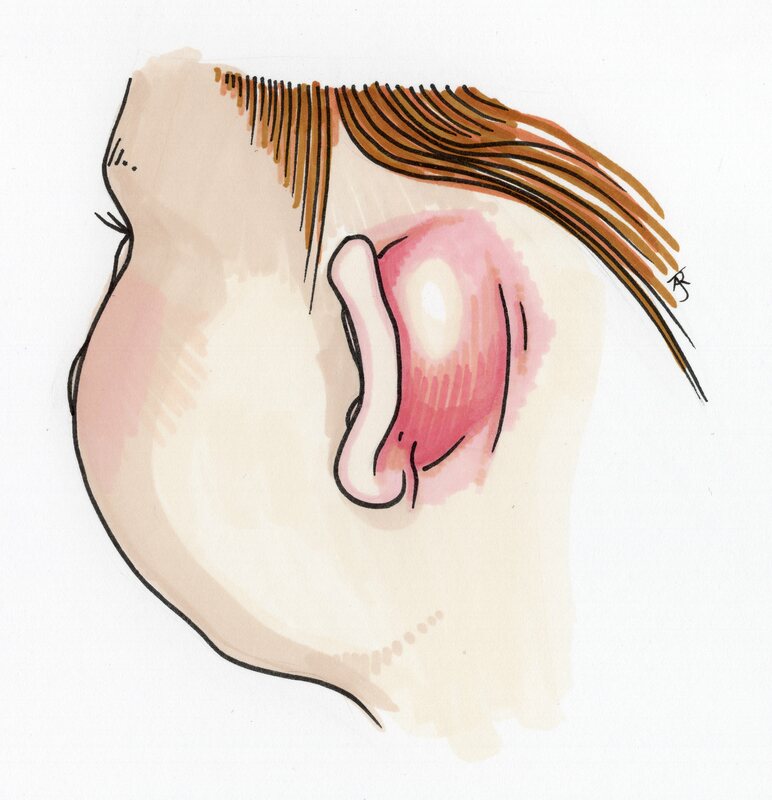 One of the most important complications to consider is mastoiditis; the spread of infection into the mastoid air cells. It presents clinically as a boggy, erythematous swelling behind the ear, which if left untreated progressing to pushing the pinna forward. Any suspected cases should be admitted for IV antibiotics and investigated further via CT head if no improvement is seen after 24 hours of IV antibiotics. Which of the following is an indication for antibiotic therapy is acute otitis media? For cases of mastoiditis, if the patient does not improve with IV antibiotics, what is the next line of management?